This is an amazing way to eat breakfast! So easy to prepare and totally yummy! 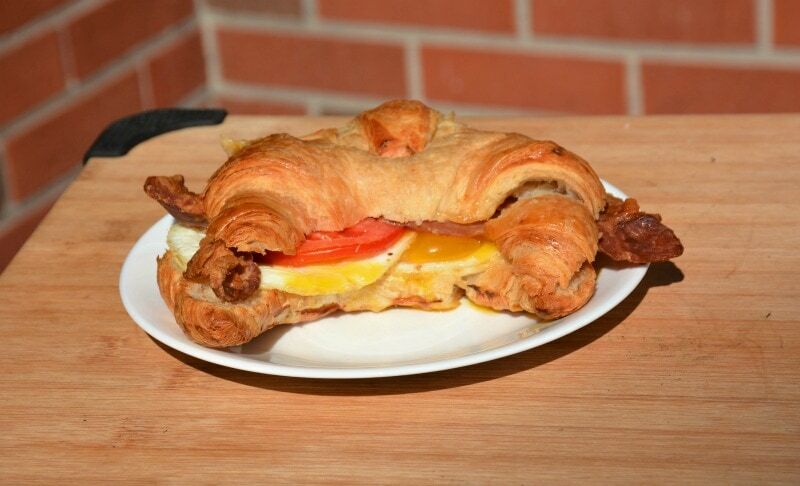 Croissants make any breakfast sandwich so much better! You really have to try it! We think you have never had a breakfast sandwich like this before. Cook bacon in a skillet, oven or microwave. Set aside. We usually fry the bacon in a skillet and then throw onions in the left over bacon fat to caramelize them. I know that it is terrible but the onions taste so good! After your bacon is cooked either fry onions in bacon fat or use butter. Stir onions frequently, over medium high heat, until tender and brown. Drain on paper towel if necessary. Set aside. Slice your tomato and set slices aside. Combine mayonnaise and garlic. Set aside. In your skillet, over medium heat, melt butter or use cooking spray. Crack eggs and cook until they are done the way you like them. Cut croissants in half. Place cheese slices on the bottom half. Place eggs on top of the cheese, right from the fry pan. The hot eggs will melt the cheese. Next place fried onions, tomato slices and then bacon on top of the eggs. Spread mayonnaise on top half of croissant and place on top of sandwich. Serve immediately and enjoy!